Lost In The Warp: WOW you REALLY gotta check this basing stuff out! 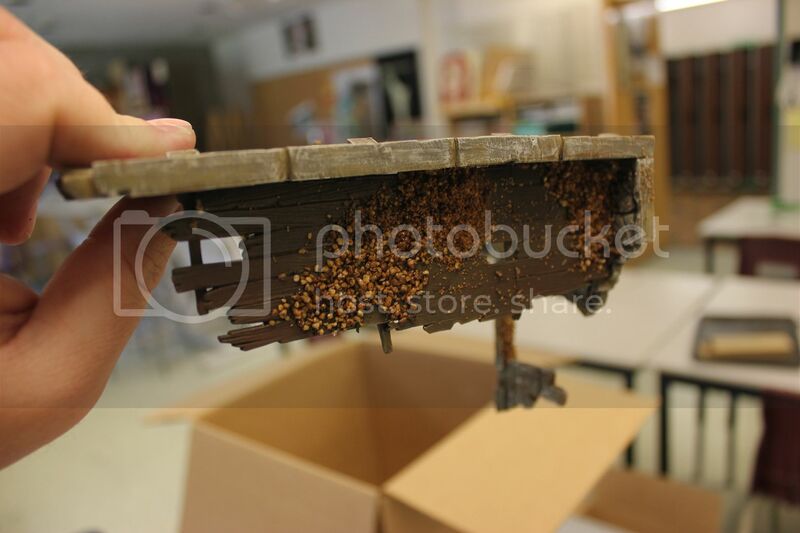 WOW you REALLY gotta check this basing stuff out! Alright, this is one of the absolute best products I have EVER come across for miniature modelling. No Hyperbole - pure truth here - this product has blown my mind. 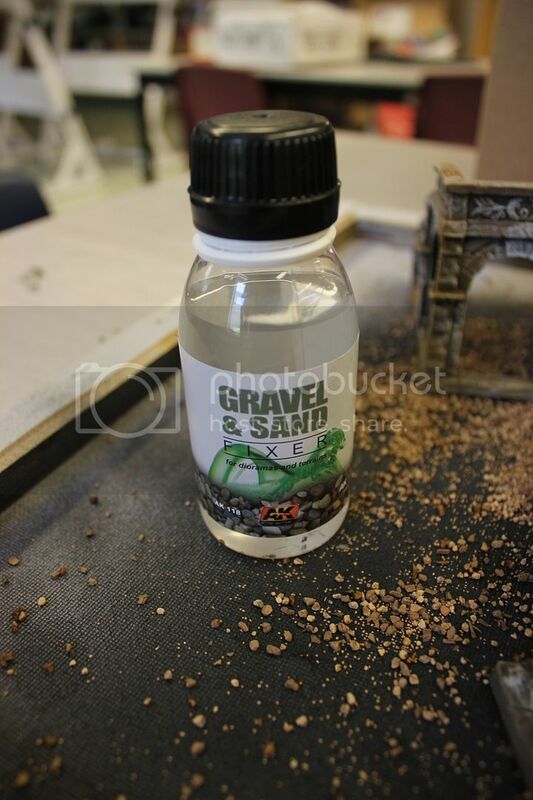 The product is AK Interactive's Gravel and Sand Fixer. This is an alcohol based clear glue that is used to attatch gravel, sand, flock, static grass etc to surfaces or- as is specific to the miniatures hobby - to scenery and bases. This glue can be added by brush or eye dropper under or over (or both) basing materials. It dries ultra fast, does not frost, wont yellow and holds really well! It can be layered where desired and any overage can be carefully cleaned up with rubbing alcohol or simply dull coated over. Where this is really going to shine is individual figure basing. So clean to use, so easy, little or no worry about getting glue all up the sides of our model's feet - pure win. Rank and file basing goes from being an absolute chore to a quick and easy task. Adding small details like leaves or individual rocks etc to even masterful basing (Golden Demons etc) just got 100% easier to controll and complete! I really cant say enough here. 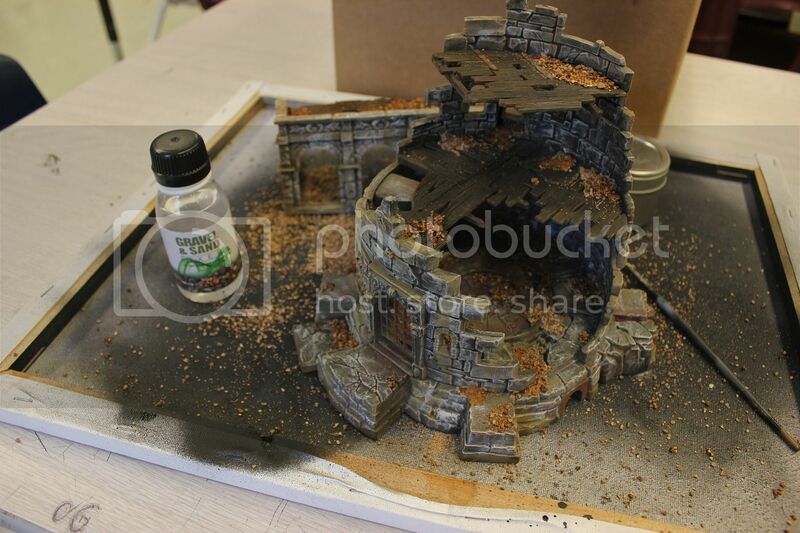 I agree and have often struggled with this in a variety of projects - particularily with scenery pieces where the glue is worked over a larger area. This product will legitimately aleviate that challenge. I love it. 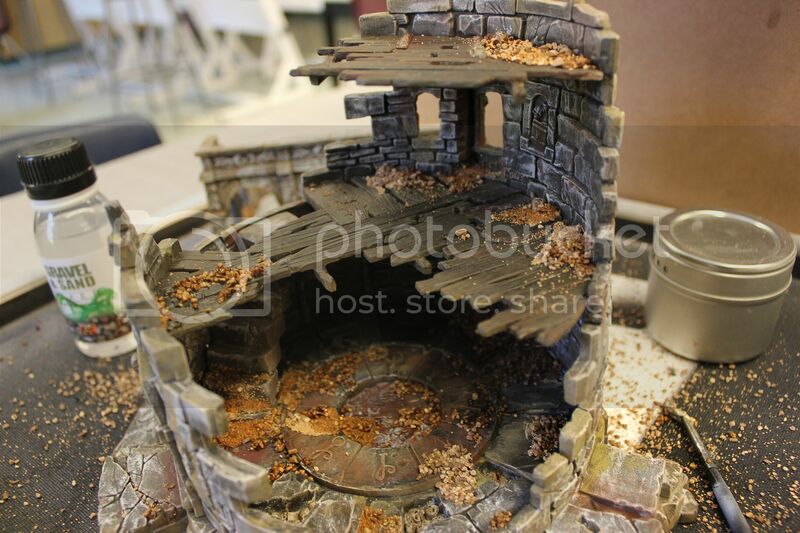 Here is a pic of it being used on some new scenery pieces I have been working on (proper pics of those with Tutorial to come when they are finished!) 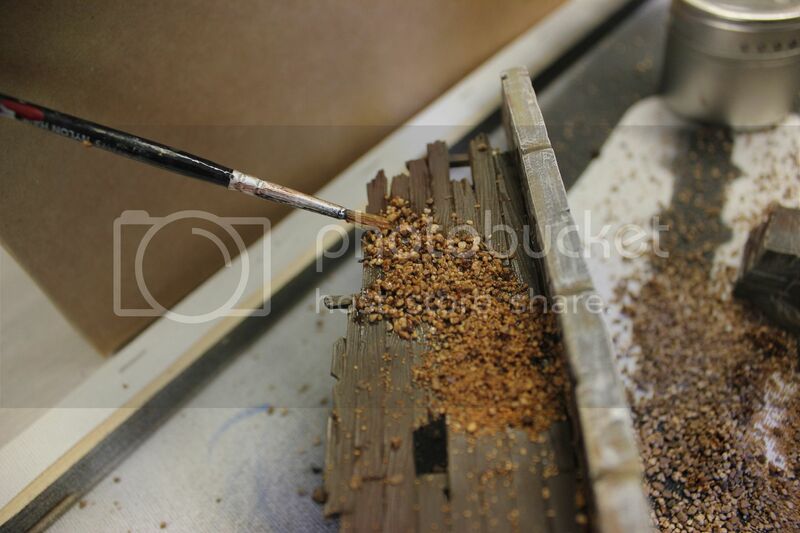 In these shots I was using a mixture of GW gravels and sand and added a couple of layers of material in a few places. This rubble is solid now, as strongly bonded as any pvc glue, (perhaps even more so with the sand because of the way it flows between and bonds individual grains) and there are no "blobs" of glue underneath. Also, in my experience thus far, in small areas it dries in seconds, though AK adds " the drying process can be accelerated with a hairdryer or any other type of heat source" which I am sure would be handy when doing layered earth effects. Look at the pictures below. In the first you see me applying the liquid with a brush. I just took a long bristled brush dipped it in the bottle and touched it to the sand and gravel allowing the capillary action to transfer it into the rubble. The next picture is me picking up the scenery piece only seconds later immediately after having put down the brush. That much adhesion THAT fast. 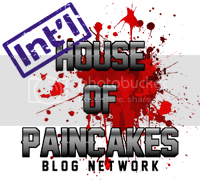 Now I admit that I have a bit of bias towards products from AK Interactive and find myself pointing towards them often as my new favorite things.... but when a company is producing so many new and genuinely innovative products it is easy to get caught up in the excitement. That being said, this is a product that reaches well beyond single techniques, specific finishes and such. This is something that could and I REALLY think SHOULD become a staple of any modellers toolbox. Gravel and Sand Fixer is the single best product I have tried since weathering powders or proper sable brushes. Do yourself a huge favor - click HERE, check it out, TRY IT! Note to my readers - I will be posting this to some forums as well, it is just so good and so useful that I really want to get the word out! Extra note to my new readers - Im not sure if this reads like some kind of advertisement but I want to assure you that I do not work for any model/hobby company (actually I am a high school teacher in Canada) and I was not paid to write this. I just like to share when I have something new and cool and know that I appreciate it when other people do as well. If you have a product or brilliant tip that you want to share - do not hesitate to send it to me and we can see if it is something I can put up on the page! Contest Winner and Warmachine stuff next week! Good review, will have to try that sometime! Wow it really does read as an advertisement you are so giddy! But as gamers I think we have all had that moment when we are so happy with something we have tried we just want to run around telling people about it. It does look like something i would like to try too! @ Runitsgoggalor - that is it exactly :) Im glad it made sense. Heading off to figure out where to buy it. Will let them know you sent me. That is a bit of an advertisement ;-p - however, that looks like it really works well...I may have to try that one. $40 US to ship to New Zealand! Damn. If you are not in north america you may want to try the european arm of ak-interactive. The shipping may be considerably cheaper?